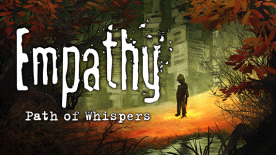 Empathy: Path of Whispers is a first-person, action adventure game with a strong focus on storytelling and exploration. Players will find themselves in a surreal world, made from people's emotions and memories, which they can manipulate and explore. Those lost memories are the key to rebuilding the crumbling world back to its former state, discovering its mysterious past and halting the impending apocalypse. Through its innovative narrative mechanics the game will challenge the player to explore and gain an understanding of the weird world they are traveling through.